Bolt d'Oro, the multiple Grade 1-winning millionaire and leading 2-year-old of 2017, has been retired from racing and will take up stud duty in 2019 at B. Wayne Hughes' Spendthrift Farm in Lexington, KY. The son of Medaglia d'Oro will stand for a fee of $25,000 S&N. Campaigned by Mick and Wendy Ruis, Bolt d'Oro began his career with three emphatic victories as a 2-year-old, including back-to-back Grade 1 wins. After capturing his 6 ½-furlong debut at Del Mar, he jumped into Grade 1 company to win the 7-furlong Del Mar Futurity (G1), stopping the clock in 1:22.91. In his third start, Bolt d'Oro stretched out around two turns in the FrontRunner S. (G1) at Santa Anita, dominating his rivals to the tune of a 7 ¾-length victory in 1:43.54 for 1 1/16 miles. In the FrontRunner, he earned the fastest speed figures of the year by a 2-year-old, including a 103 Beyer, -1 ½ Thoro-Graph, and 4 ¾ Ragozin. Bolt d'Oro also became the only multiple Grade 1-winning 2-year-old colt from his crop in North America and would become the biggest favorite in Breeders' Cup Juvenile (G1) since Dehere in 1993. Bolt d'Oro bobbled at the start from the 11 post in the Juvenile, costing him a wide trip throughout. He would rally to be on the board, traveling 78 feet further than the winner on Trakus. In his highly-anticipated 3-year-old debut, Bolt d'Oro squared off against McKinzie in the San Felipe S. (G2) at Santa Anita, dueling with that rival through the stretch to win the 1 1/16-mile race. They hit the wire in 1:42.71 and earned a 101 Beyer, providing one of the most memorable finishes in 2018. Bolt d'Oro went on to be runner-up to eventual Triple Crown winner Justify in the Santa Anita Derby (G1), earning a 102 Beyer for that performance at 1 1/8 miles. He retires with earnings of $1,016,000 and enters stud as Medaglia d'Oro's fastest ever Grade 1-winning 2-year-old. 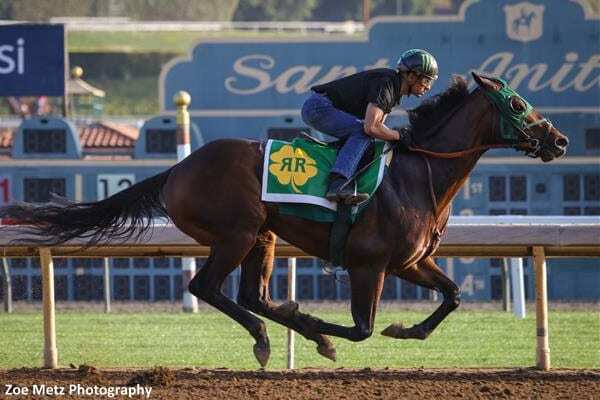 “Bolt d'Oro is a big, scopey horse, and if you look at him, you would think two-turn horse. You wouldn't necessarily think precocious 2-year-old,” Toffey said. “Yet that's exactly what he was—a very precocious 2-year-old and very talented. I think when you see one that is kind of going against the bias, that speaks volumes about how talented a horse he is. “I think we saw this year, he demonstrated in his race with McKinzie just tremendous talent and ability. He literally ticks all the boxes, to overuse the expression. But he sure does that. He's an absolutely gorgeous horse,” he added. A $630,000 Saratoga Select yearling, Bolt d'Oro is out of the multiple stakes-producing A.P. Indy mare Globe Trot. Bred by WinStar, he hails from a deep Claiborne female family. For more information about Bolt d'Oro, please contact Des, Mark, or Brian at 859-294-0030, or visit SpendthriftFarm.com. This entry was posted in Bloodstock, NL List and tagged bolt d'oro, spendthrift farm, Thoroughbred breeding, Thoroughbred sires, thoroughbred stallions by Edited Press Release. Bookmark the permalink.